Whether you plan to start a brand new pool construction project or renovate an existing pool, the fall and winter seasons are the perfect time of year to begin. When warm and sunny weather returns, your swimming pool will be complete and ready for you to enjoy your personalized outdoor space with family and friends. Many homeowners choose to start their pool building or pool remodeling projects during the colder months because they can create a more leisurely and enjoyable construction experience. You can take your time and be very intentional and strategic about your pool design. When the hectic summer season slows down, this time of year allows you to enjoy the different construction phases of your pool design without feeling the anxiety of not getting to enjoy your pool during peak swimming season. Your pool project will tend to run more smoothly because more time can be dedicated to your outdoor project. During the spring and summer months, swimming pool projects are in high demand and, as a result, it often takes swimming pool contractors a little longer to complete the construction. Higher volume requires more manpower, which can create some delays in scheduling when trying to meet the needs of the homeowners who are eager and ready to build. One of the most important reasons to begin your pool construction project during the off-season months is the potential cost savings. You will save money by choosing to start your build before the industry-wide costs begin to rise as spring and summer approach. Some pool contractors in San Antonio offer end-of-the-year specials that can save customers a considerable amount of money. If you know you want a swimming pool by next summer, save yourself time, energy and money by starting your pool build now. With all that said, there are key aspects to a successful pool build that are timeless. Getting your pool built at the most opportune time is a great idea. It’s important that your finished product is built in a timely manner, but it is extremely important that your swimming pool is well-made and enduring. Choosing to work with a San Antonio pool builder that offers quality products and first-class service will put your mind at ease not only during the construction phase of your pool project but for the entirety of your pool ownership. Keith Zars Pools in San Antonio focuses on the tiniest of details when it comes to your design and construction of your pool. No two swimming pool contractors are exactly alike. Each builder varies in terms of quality and ability. To help make your pool project experience effective and enjoyable, and one that delivers a custom, first-class product, choose a reputable company that offers the best and most comprehensive services, products, technology, warranties and customer care. A swimming pool is a major investment, so you want a company that will provide you with all these things. Keith Zars Pools is a one-stop-shop operation, employing more than 400 dedicated and skilled experts, making it the highest ranked pool company in San Antonio. Keith Zars Pools handles every aspect of the pool-building process. The company incorporates its patented and state-of-the art equipment and technology into every swimming pool design, and its team of experts guarantees customers the highest quality and most beautiful custom swimming pools in the industry. 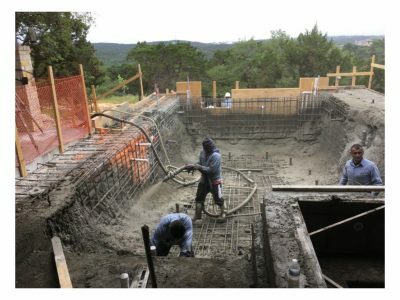 To get started on your swimming pool build, call Keith Zars Pools at 210.494.0800 or visit keithzarspools.com.